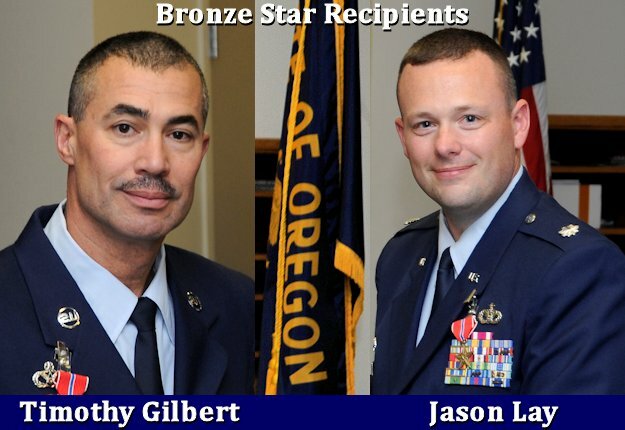 PORTLAND AIR NATIONAL GUARD BASE, Ore.- Two Oregon Air Guardsmen were recently awarded Bronze Star Medals during a ceremony here for leading engineers during a recent deployment to Afghanistan, despite persistent rocket attacks and indirect fire. Lt. Col. Jason Lay and Chief Master Sgt. Timothy Gilbert served alongside one another during a recent deployment to Bagram Airfield, Afghanistan, in support of operations Enduring Freedom and Resolute Support. In attendance was Maj. Gen. Daniel Hokanson, adjutant general, Oregon, who praised both Airmen for their dedication to the mission. "They set a new expectation for others to aspire to," Hokanson said. Both service members are assigned to the 142nd Fighter Wing Civil Engineer Squadron here and deployed with the 455th Expeditionary Civil Engineer Squadron from April 20, 2014 to Oct. 14, 2014. "Lt. Col Lay and Chief Master Sgt. Gilbert are good people, hard workers - and they fully embraced the mission - to keep the airway open and to keep the people safe on base," said Chief Master Sgt. John McIlvain of the 142nd Civil Engineer Squadron, who served with Lay and Gilbert on the deployment. Lay received the Bronze Star for meritorious service as the commander of the 455th Expeditionary Civil Engineer Squadron, at Bagram Air Field, Afghanistan. He led a team of 101 total force engineers who managed a 740-acre airfield, executed 970 work orders and oversaw 35 construction projects worth more than $123 million. The actions of these Oregon Airmen ensured the airfield remained capable of supporting ongoing combat operations at the busiest combat logistics center operated by the Department of Defense. "The leadership of Lt. Col. Lay and Chief Master Sgt. Gilbert enabled them to push themselves and their team to very high levels," said Col. Donna Prigmore, 142nd mission support group commander. Gilbert received the Bronze Star for his distinguished service as chief enlisted manager of the 455th Expeditionary Civil Engineer Squadron. He led 99 Airmen through the completion of 970 work orders, 13 high priority projects and maintenance of the airfield. Prigmore said both awardees possess a tremendous amount of technical expertise and the leadership needed to accomplish the mission under tight deadlines. "It was a fast-paced, no-fail mission," said Gilbert about the significance of the deployment. "We helped oversee the transition between Operation Enduring Freedom and Operation Enduring Support, which included a large decrease in the number of boots on the ground." The Bronze Star Medal was established in 1944 and is the fourth-highest individual military award and the ninth-highest by order of precedence in the U.S. military. It is awarded to members of the armed forces who distinguish themselves by heroic or meritorious service in a combat zone.